Does it put a pit in your stomach to think your confidential business data is potentially being accessed by users around the world who aren’t your employees? Network security issues can also surface for days and even weeks before you or your technology department might even be made aware of. To give you a better understanding of how common it is for your company to experience network security issues, we’re providing you with some interesting (and rather scary) statistics that illustrate just how frequent these network security issues come up. As of March 2018, 43% of cyber attacks target small businesses. Average time to detect a malicious or criminal attack by a global study sample of organizations was 170 days. In 2016, 40% of companies expect a data breach caused by malicious insiders. Of course, keeping anti-virus programs up-to-date on all employee computers is a core piece of any security strategy. The truth is, though, many small and medium businesses don't have the in-house expertise to keep up-to-date on security issues. IT security professionals have a hard enough time keeping up with the latest security threats and counters. It's nearly impossible for a jack-of-all-trades IT person to be able to stay on top of everything. And with IT security expertise increasingly in demand, it will become harder and harder to keep those experts on staff for smaller businesses. So knowing all this, what should you do? 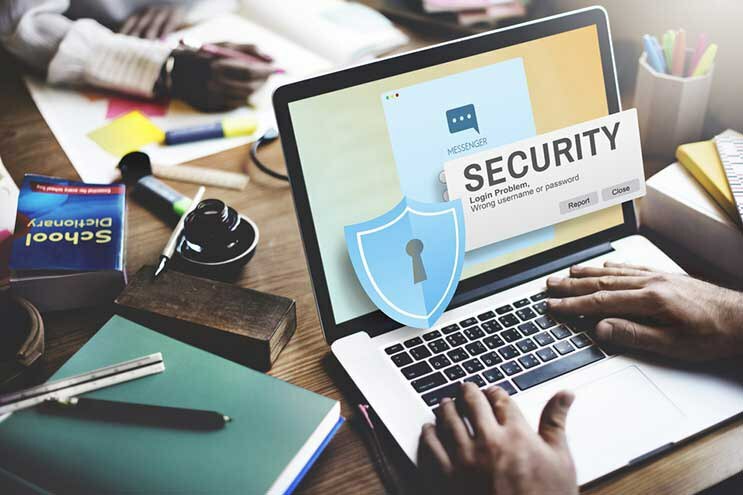 The Federal Communications Commission (FCC) These 10 pieces of advice from the FCC: 10 Cyber Security Tips for Small Business are geared for small business security. We recommend reading and following this savy advice to the best of your ability. 1. Train employees in security principles. This first tip may seem a little basic to yourself and your employees, but establishing fundamental security practices and policies for everyone at your company automatically ensures you’ll have a secure network. Establishing appropriate Internet use guidelines that detail penalties for violating company cybersecurity policies is something all staff needs to be aware of. The implementation of rules and behavior describing how to handle and protect customer information and other vital data is a great way to provide your employees with the tools they need to keep the network secure. Updating… something that we all tend to overlook, simply because we just don’t feel like installing the latest security updates or “security patches” (for techies). But you must remember to keep your machines clean and the software relevant! Having the latest and most updated version of security software, web browser, and operating system are the best defenses against viruses, malware, and other online threats. Make it easy, and set reminders for yourself. After each update, you can set an antivirus software to run and check your machine. And as soon as key software updates are available, install them. Don’t wait or it could be too late. 3. Provide firewall security for your Internet connection. A firewall is a set of related programs that prevent outsiders from accessing your company’s data on a private network. Just like a fire wall in your car or a fire door in your business or home, they all work the same way in protecting you from something. In this case, it’s not protecting you from fire, but from intruders. Double check your operating system’s firewall is enabled. If you don’t have it, install a free firewall software (available online). Also, if any employees from your company are working remotely or from home, make sure their system(s) are protected by a firewall. This is something that can easily slip through the cracks, so have those remote employees stay up to date on their firewall settings. 4. Create a mobile device action plan. Mobile devices (smartphones and tablets) can unfortunately create significant security and management challenges, especially if they hold confidential information or can access your corporate network. Make sure you’re requiring all mobile users to password protect their devices, encrypt their data, and install security apps. This helps prevent criminals from stealing information while the mobile device is on public networks. Since these devices are portable and aren’t stationed at a specific desk, be sure to set reporting procedures for lost or stolen devices. 5. Backup all company data, information and documents. Backing up data is also another thing we typically tend to forget to do, especially since our days are filled with other important work tasks. However, regularly backing up the data on all company computers can and will save you so much frustration later down the road. Critical data you should back up includes word processing documents, electronic spreadsheets, databases, financial files, human resources files, and accounts receivable/payable files. If you are able to, backup your data automatically, or at least at a weekly basis. Storing the copies either off site or on the cloud is also a safe and easy way to keep track of all the data you have. 6. Control physical access to your computers and create user accounts for each employee. Your company and all its data is confidential and should only be accessed by you and your employees. Make sure you are preventing access or use of business computers by anyone who is an unauthorized individual. Laptops in particular, are really easy targets for theft and can easily be misplaced or lost. So always lock them up or store them in a trusted place when unattended. Also make sure a separate user account is created for each employee that requires strong passwords. Administrative privileges should only be given to trusted IT staff and key personnel. 7. Secure your Wi-Fi networks. You most likely have a Wi-Fi network for your workplace that always needs to be secured, encrypted, and hidden. Your business Wi-Fi network should also always have a password that only your employees have access to. You can also hide your Wi-Fi network for even more protection. To do this, set up your wireless access point or router so it does not broadcast the network name to any other location or business nearby. This name is known as the Service Set Identifier (SSID). 8. Employ best practices on payment cards. Working with online banking systems or processors can be risky because of the amount of stored sensitive information your business has online. It’s important for your company and your piece of mind to use the most trusted and validated tools. You may also have additional security obligations pursuant to agreements with your bank or processor. Isolate payment systems from other, less secure programs, and don’t use the same computer to process payments and surf the Internet. 9. Limit employee access to data and information. It might make sense to have just one employee control all access to your company’s data systems. However, this is not the best way to prevent network security issues. Employees should only be given access to the specific data systems that they need for their specific job duties and should not be able to install any software without permission. This last tip is one of the simplest ways to avoid network security issues because it doesn’t require much time to update or change your passwords. Requiring your employees to use unique passwords and change their passwords every three months is a great way to ensure everyone’s computers are safe and protected. Consider implementing multi factor authentication that requires additional information beyond a password to gain entry, such as a security question. You can do this by checking with your vendors that handle sensitive data, especially financial institutions, to see if they offer multi factor authentication for your account. At AIS, we know the importance of keeping your information secure. Start by talking to your IT staff to ensure that your company is doing the minimum to keep your data secure. If you don’t have dedicated IT staff or don't think you can handle your requirements yourself, consider managed IT services. Click on the image below to download our free eBook and discover what outsourcing can do for you. Better yet, contact one of our business technology consultants to discuss your IT concerns and let us help you build you a solid secure network plan that alleviates the stress of your network security issues and concerns.